Such conviction to his beliefs. He must truly believe it. “For heavens sake where do they all come from? Look it is simple – there are no autistic people in populations where there has been no vaccination! Over three million kids have not been vaccinated in the UK where vaccination is optional and parents have chosen not to vaccinate. More than ten years of aggressive searching in this group has failed to find autistic people! Like the Amish, like Homefirst there are no autistic people in this group. The only person who needs to wake up is Mr. Bateson. He writes for Age of Autism, right? Kim Stagliano, who writes and is an editor at AoA has a child who is not vaccinated and is autistic. So, there you go, Mr. Bateson, that’s one. Shall we continue? One of the reasons why we scientists and reasonable people can say without a doubt that autism is not caused by vaccines is because we’ve compared rates of autism in vaccinated and unvaccinated populations. To do so, we required to find unvaccinated with autism, otherwise we wouldn’t have a rate of autism in that population. 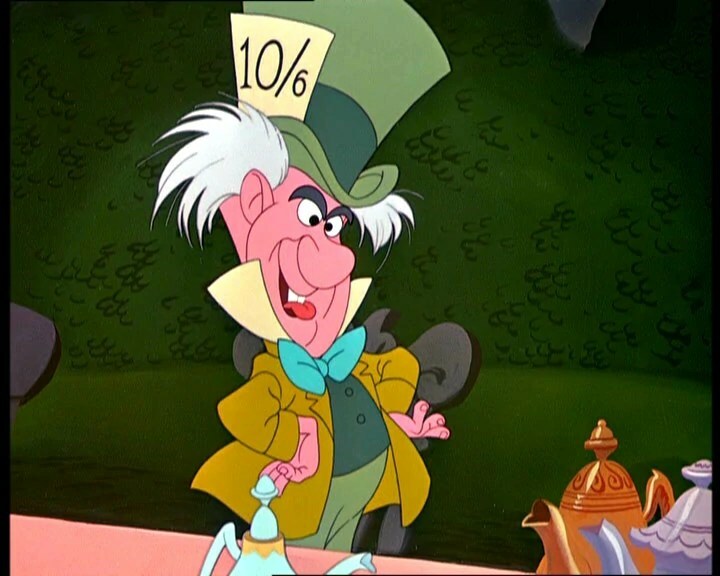 (Zero divided by any number throws out an error in any statistical package… And in math, you cannot divide zero.) Mr. Bateson could go to any of those researchers, email them, and just ask for the numbers of unvaccinated autistics. In a perfect world, the fool would just pick up those papers and look at the tables. But that would be a reality-shattering proposition for him, I suppose. Like any other anti-vaccine activist, he comes off at the kind of person who would crumble into a heap of goo at the sight of evidence conflicting with his reality. J Appl Toxicol. 2013 Aug;33(8):700-11. doi: 10.1002/jat.2855. Epub 2013 Feb 11. 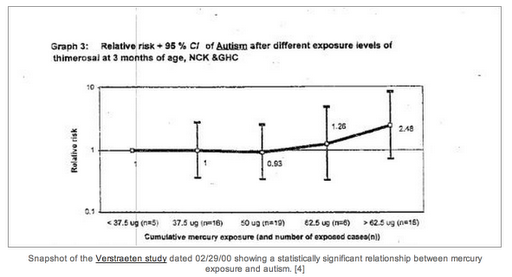 Toxicity of ethylmercury (and Thimerosal): a comparison with methylmercury. Dórea JG1, Farina M, Rocha JB. Ethylmercury (etHg) is derived from the metabolism of thimerosal (o-carboxyphenyl-thio-ethyl-sodium salt), which is the most widely used form of organic mercury. Because of its application as a vaccine preservative, almost every human and animal (domestic and farmed) that has been immunized with thimerosal-containing vaccines has been exposed to etHg. Although methylmercury (meHg) is considered a hazardous substance that is to be avoided even at small levels when consumed in foods such as seafood and rice (in Asia), the World Health Organization considers small doses of thimerosal safe regardless of multiple/repetitive exposures to vaccines that are predominantly taken during pregnancy or infancy. 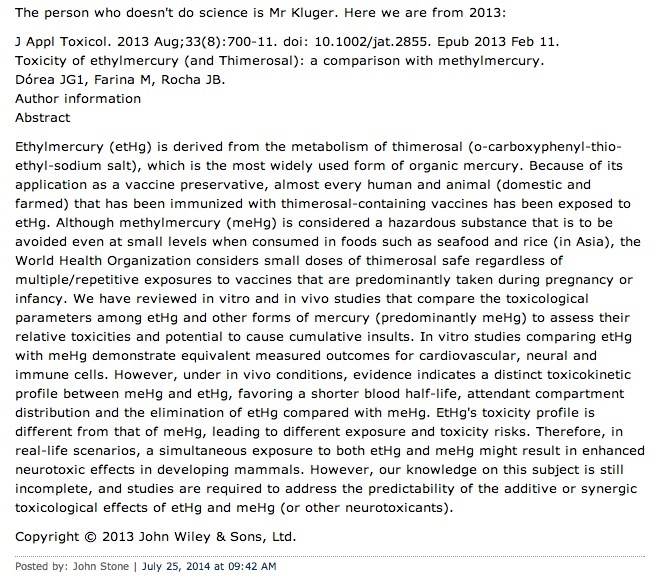 We have reviewed in vitro and in vivo studies that compare the toxicological parameters among etHg and other forms of mercury (predominantly meHg) to assess their relative toxicities and potential to cause cumulative insults. In vitro studies comparing etHg with meHg demonstrate equivalent measured outcomes for cardiovascular, neural and immune cells. However, under in vivo conditions, evidence indicates a distinct toxicokinetic profile between meHg and etHg, favoring a shorter blood half-life, attendant compartment distribution and the elimination of etHg compared with meHg. EtHg’s toxicity profile is different from that of meHg, leading to different exposure and toxicity risks. Therefore, in real-life scenarios, a simultaneous exposure to both etHg and meHg might result in enhanced neurotoxic effects in developing mammals. However, our knowledge on this subject is still incomplete, and studies are required to address the predictability of the additive or synergic toxicological effects of etHg and meHg (or other neurotoxicants). All bolding is mine, by the way. I’ve told you before that in vitro (in a lab) is different than in vivo (in an actual organism), and this supports it. But, in the weirdo’s crazy little world, this one study is the Holy Grail of comparing ethyl mercury to methyl mercury. Why? I have no clue. This study confirms that biological systems are more complex than cells in a petri dish, and that we react differently to the ethyl mercury that thimerosal metabolizes into. In essence, we don’t get hurt or become autistic, like anti-vaccine activists and weirdos might want us to believe. So thank you, John Stone of Age of Autism, for confirming this for us. If you asked me what a child with Down syndrome looks like, I would probably tell you that the child has slanted eyes, a small chin, flat and wide face, a short neck, and extra space between the first and second toe. (I got this from Wikipedia, by the way.) These physical characteristics come from the extra chromosome found in people with Down syndrome. The same can be said for people with other disorders and conditions that affect both body and mind. But what does autism look like? She follows up with a picture of her child and a picture of a child with mercury poisoning. Go look at the post (or the picture) yourself if you want to see it. It’s not for scientific or educational purposes, so I refuse to violate the child’s privacy by posting his pictures openly online. She continues the post with a gross misunderstanding of pharmacokinetics, immunology, and toxicology. Frankly, if I were part of the graduating class that put forth this nurse, I’d be embarrassed. What really grinds my gears is that she is trying to convince her readers that her child has mercury poisoning because he looks like a mercury-poisoned child. To me, her child looks sleepy (and annoyed) more than suffering from mercury poisoning. 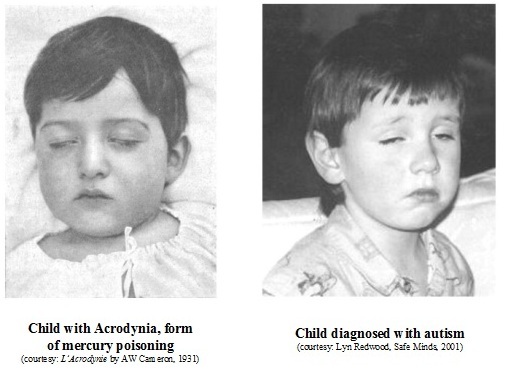 Go and Google “sleepy face” and tell me if those are all mercury poisoned people. Is that what autism looks like? Not at all. Autistic children look all sorts of ways, and you’d be hard-pressed to identify an autistic child out of a line-up on physical traits alone. Oh, good, I’ll have more to blog about.